I was looking through some older photos, the stuff I typically post on the Enduro360 Instagram page and I ran into this photo. It has a couple of great stories that go with it about the bike that just wouldn’t quit going. The story goes like this. I had a 2009 KTM 450xc-w. 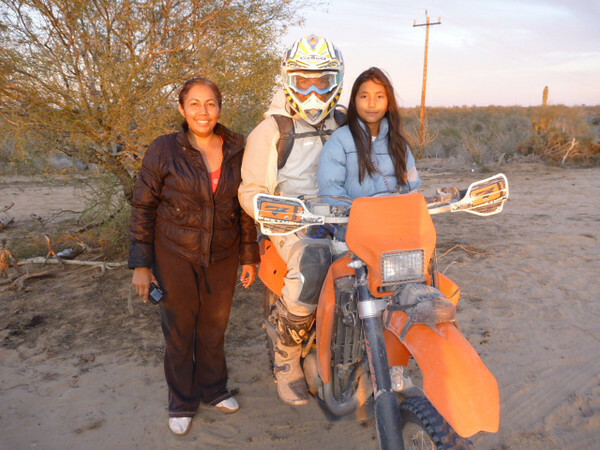 I liked the bike but struggled some racing it in the desert, frankly it was sort of slow. I took it to the Missouri ISDE Qualifier in 2009. It was a rainy, messy race. But I won the senior class and a trip to the ISDE in Portugal. (Wow how time flies now, I had to look up what year Portugal was). The qualifier was pretty brutal. At the end of the Missouri race I had no brake pads front or rear. The rear’s had gone out late on day two. I started the last test with no pads in the bike, could not get them in for the mud. By the end of the final test the fronts were down to the metal too. Anyway I got home and found out I had run all the oil out of the motor side on the 450, the one with the separated oils. Not a drop was left. This would happen on these models when pushed at high revs too much. In this case it was from a wet sand special test that we ran multiple times in the event. Well, I filled the 450xcw up with oil and managed one more race the following weekend, but she was making noise by the end and obviously due for a tear down. We were right in the middle of the race season. With the ’09 out of commission I needed another bike ASAP. I set out to find an older RFS. When I bought the 2006 450xc you see pictured, it was in pretty rough shape. It had obviouisly been well used and needed some love. But I was in desperate need of a bike to race the following weekend. I did a quick clean up and prep and headed off to the desert to race. The XC ran pretty good in its first race and I was happy with it. Fast forward a few more months, the 450 has been mine for a while. I liked this 450xc so much I bought another one to match. One for race bike and this one became the trail bike. The motor was bit tired, it used some oil but ran fine. Finally I took it to Trail Tricks to get a new top end done. It was at about this time that I ran into the previous owner. He rather shyly asked me if I still had the old 450. I said yes and it was getting a new lease on life with the fresh top end. He seemed rather surprised, I suspect he knew that it had been used a bit harder than he had first led on when I bought it. I have just a couple of rides on the motor when I head to the 2010 Baja 1000. Long story short, a crazy set of events transpire and I ride a 1,000 miles of the race course chasing a girl who is racing solo. It was all a spur of the moment occurance. I literally just got on my bike and started for La Paz with her. Just another 1,000 miles of a long life, what could the harm be? Well, with no fore planning, I did not have a spare air filter, or a spare anything for that matter. The poor XC went through every silt bed on the course. In the end she was still purring just fine. Returning home, I dreaded what I would find in the airbox after running so many miles on one filter. As I suspected, so much dirt had been sucked in the mouth of the carb, only a brown coating could be seen. Not a spec of metal was visible, it was so thoroughly coated with dirt. We actually threw that cylinder away. I was fortunate that a nice used one was found by my mechanic and new piston and set of valves went in, again. Night time during the 2010 Baja 1000, I rode from dusk to dawn with the only mildy improved headlight. With another fresh top end, the 450xc keeps racking up miles. I have dual sported it and use it for all kinds of riding. It made at least one more trip down the Baja peninsula with Alexander Smith doing the recon for Malcolm’s Six Days of Baja ride. Fast forward another year to 2012 and the miles are really piling up. The old 450 runs great, but the countershaft splines are getting very worn. I can hardly venture a guess at the total mileage, maybe 15,000. I decide to pick up a reasonably clean 2006 525exc to replace the 450. But as I start working on the new purchase, it has lots of chassis issues that will need addressed. But it has a great low hour motor. That leads me to decide it best to just swap the motors, the 450 becomes the 525 and I part out all the leftover pieces. This was my bike build project for the year. I stripped the newly designated 525 bike to the ground and gave it a full face lift. One more new lease on life for the aging bike. 2013 came around and I decided to use this bike to race the inaugural Baja Rally, with pretty good success I might add as it took me to a 3rd place finish. Now another year has since passed. The 525 has been relegated to tour bike fleet and keeps logging more miles. I guess there are not too many original parts left on it. But the original frame and subframe are still holding up well. We don’t think much of this frame by today’s standards, but it was a lot tougher than anything previous from KTM. I keep thinking I should clean the old 2006 up and sell it. But it isn’t really worth much money. I will probably just run it until it dies. Who knows when that will be. For now she is as strong as ever and still one of my personal favorite bikes to ride. I should note that I wrote this story a while back, but have been hesitant to post it. I am sure I am tempting fate by calling this bike indestructible. But two more Baja trips have come and gone already in 2015 for the 525 without issue. To the clients it is just one of the group of matching orange bikes in the fleet. They know nothing of its long and storied history. Can you believe I once got an email one time from a reader who asked if I had any Enduro360 bikes I wanted to sell, just so he could have the pleasure of owning one? I can’t imagine anyone who would really want a bike after I was through with it! As for the 2009 450xcw, once it was rebuilt, it got sold off and I swore off any of that generation bikes. But it just so happens that the owner contacted be out of the blue recently to tell me what a great bike it has been for him! He too wanted to know if I had anything else for sale.